Instagram Stories are undoubtedly popular with Instagram’s audience. If they weren’t then Instagram wouldn’t have launched the ‘beefed up’ version, IGTV a couple of months ago. With this in mind, there’s clearly an opportunity for brands to capitalise on the popularity of stories in order to generate sales. One way in which to do so is to incentivise your audience by creating platform-exclusive offers. The visuals you create to accompany offers such as exclusive discount codes, free shipping promotions, or even a chance to win something can really grab your audience’s attention. Give your audience a reason to engage with you. Another way in which you can use stories to your advantage is by creating story Ads. Story ads can help you amplify the reach of your Stories content to drive traffic to your products and boost sign-ups to newsletters. In order to create Story ads, you can use Facebook Ads Manager, Creative Hub, or the API. This will allow you to effectively target your audience, based on demographics, interests, and location, meaning a better chance of a higher return on investment. You could also consider using your stories to give a ‘behind the scenes’ look, or provide them with snippets of information from events you’re attending. There’s a number of independent clothing brands who do this extremely well, for example 11 Degrees, which was set up by Gaz Beadle of Geordie Shore fame. They regularly use their Instagram stories to promote events they’re at, such as British Superbike races and boxing events, as well as providing a first-look at new products. Of course, there are a number of other ways in which you can use stories to drive sales, and these are just the tip of the iceberg. But is it really worth it? Instagram has reported 300 million daily users for Stories. If you have more than 10K followers on Instagram and a business account, you can link out from your Stories. You can hashtag and geotag Stories for the chance to get into the Featured Stories for the tags you choose and amplify your reach. Think of it as an opportunity, not a hindrance. Swipe up links are particularly useful for promoting the sale of a particular product, or the launch of a new one, as they take the user direct to the relevant landing page. This will often result in a number of conversions, and even if they don’t convert, you can use alternative retargeting methods to try and encourage that user to come back and complete their purchase. Although we mentioned that Stories are only visible for 24 hours, this true for the majority of the time, as ‘Story Highlights’ can be added to your profile, meaning they can live on. 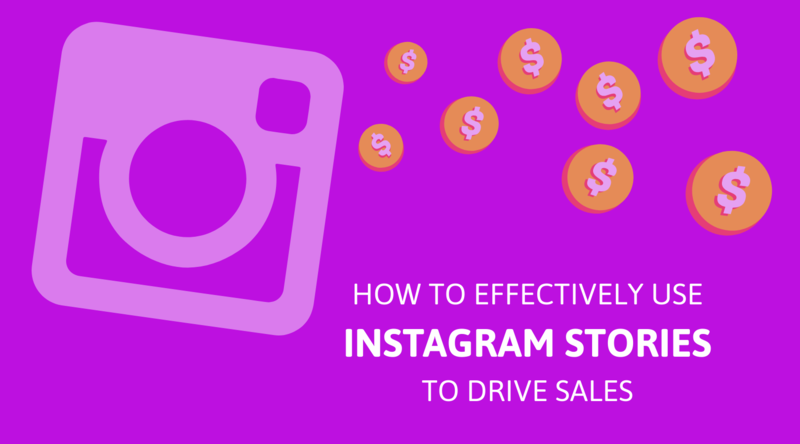 If you want to know more about Instagram stories, there are numerous guides out there, but your best bet is just to give it a try and see what works! Get stuck in, don’t be afraid to try new things, but always remember to have a goal in mind to measure the performance by.